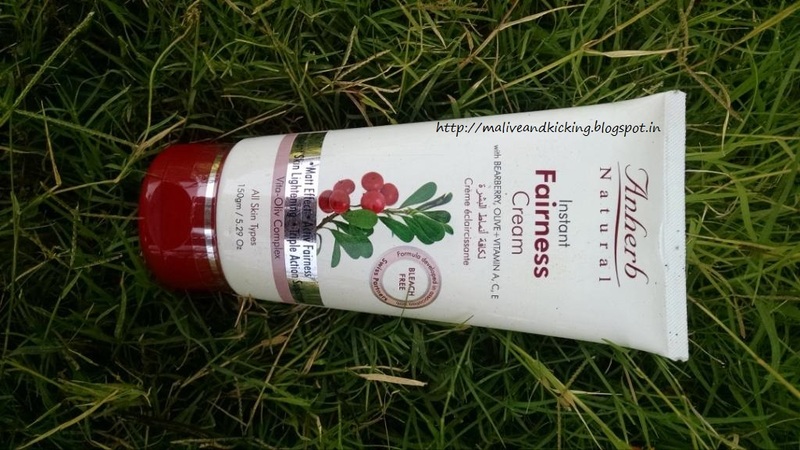 Anherb has recently launched some new products, out of which one is an Instant Fairness Cream. The brand boasts of developing its formula in association with Swiss Partners and here I am to check on its effectiveness. It is a unique active-fairness treatment that imparts instant fairness. 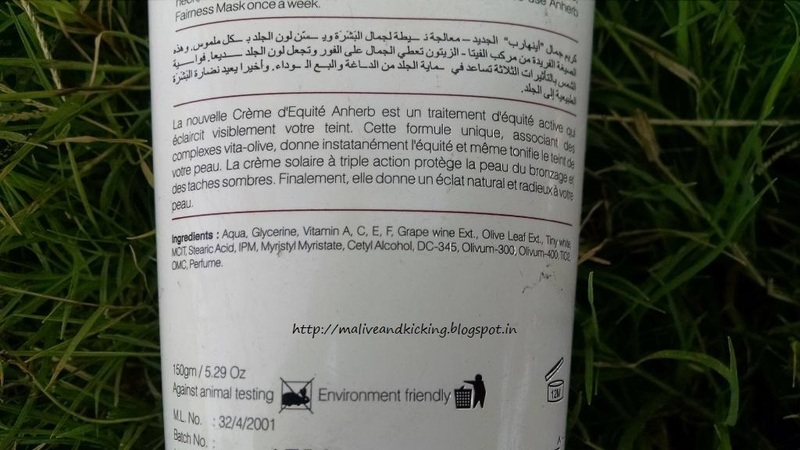 Ingredients: The cream has so many vital vitamins in it other than Grapewine extract, Olive Leaf extract. Vitamin A : Imparts more youthful and radiant appearance. Vitamin E : Helps to lighten dark spots, acne scars and pigmentation. Imparts photoprotection. Vitamin C : Helps to improve skin tone and protect the skin from sun damage and premature ageing. Vitamin F : Skin nourishing. How to use: After cleaning, apply on face, neck, hands etc. at any time of the day. Packaging:The new Anherb Instant Fairness Cream comes in a off white squeeze tube packaging with maroon color flip cap on it. The cap shuts tightly. 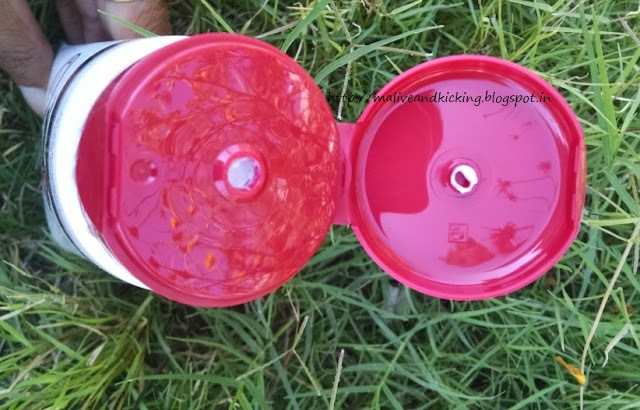 The nozzle on the cap helps to dispense required quantity with total ease. The first glimpse of the cream reminded me of Fair & Lovely cream due to its texture. The cream is in white color with light shine in it similar to Fair & Lovely. Thats why before I could start using the cream, I wished it doesn't leave that white cast on my skin post application. The cream has lovely floral smell that stays for quite long and I liked it a lot. The cream is not heavy on skin and gets absorbed with light massage. It lives upto its claim of giving matte effect by not leaving a shiny cast behind. Even it controls shine on oily skin, so will be liked by oily skin people too. The only thing which lacks in the cream is moisturizing capacity for dry skin like mine. So I need to double it up with some lotion. There is definitely an instant glow on the skin as you apply it on your face and neck which I consider just a timely fairness. Because I don't think any product can give you fairness in first application. 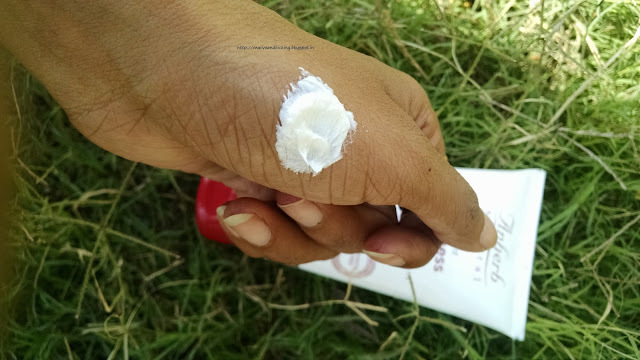 The cream is a unique combination of multi-vitamins A, C, E, F etc and is a promising product for skin lightening. Upon a regular usage of around two weeks, this cream has also smoothened my skin's texture with its botanical ingredients like Grapewine extract, Olive Leaf extract. Some of minor patchy marks on the face have got dull. It caused me no breakouts. I was also expecting sweaty feel on skin on its usage, but thankfully it didn't happen so ;) At times, I have felt that it can retain my makeup intact for longer if I use it as base. Not very moisturizing for dry skin type. The exact SPF content is mentioned on the website, but not on tube. 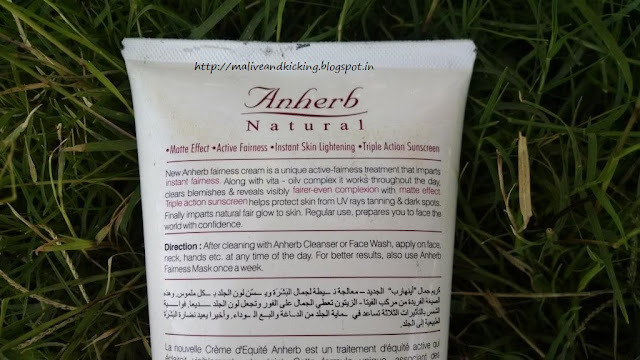 Anherb Instant Fairness Cream is good choice for everyday use to get naturally radiant skin without any bleaching agents. It works to reduce patchy skin and gives toned skin upon prolonged application. The non-greasy texture and SPF content make it a decent day cream for anyone. Good product for oily skin ladies. Winters and dry skin request me to stay away from this product. :) Great review. Thats not only for oily skin, but yes if ur skin is thirsty for extra moisture then its a bit less in hydrating capacity. Ya.. thats not as expensive as other brands in the same line. I am not much into fairness products. But for those who like it this seems like a good product to try. It has benefits for skin, so it can be tried.